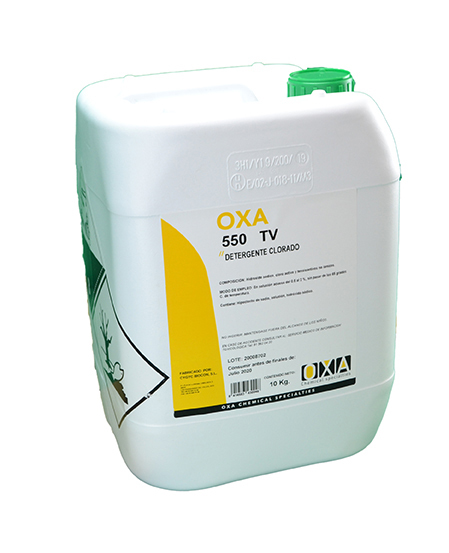 OXA - 550 CLOR TV presents a stabilized chlorine content is not less than 600 ppm. in 1% aqueous solution. Due to its content of surfactants, detergents and wetting and strong alkalinity, improves-cleaning and disinfecting power. This product is suitable for use in Communities, Hospitality, Health Centres, etc; mainly for cleaning and sanitizing rooms, waiting rooms, classrooms, bathrooms, urinals, toilets, replacing lead to conventional bleach. Chlorinated non-foaming detergent for food industry.